For peoples, generally, their story of the Universe and the human role within the universe is their primary source of intelligibility and value. Only through this story of how the Universe came to be in the beginning and how it came to be as it is does a person come to appreciate the meaning of life or to derive the psychic energy needed to deal effectively with those crisis moments that occur in the life of the individual and in the life of the society. Such a story communicates the most sacred of mysteries …. and not only interprets the past, it also guides and inspires our shaping of the future. It’s all a question of story. We are in trouble just now because we are in between stories. The Old Story—the account of how the world came to be and how we fit into it—sustained us for a long time. It shaped our emotional attitudes, provided us with life purpose, energized action, consecrated suffering, integrated knowledge, guided education. We awoke in the morning and knew where we were. We could answer the questions of our children. We could identify crime, punish transgressors. Everything was taken care of because the story was there. But now it is no longer functioning properly, and we have not yet learned the New Story. Thomas Berry was a Catholic priest of the Passionist order, cultural historian, cosmologist and “Earth scholar”. Among advocates of deep ecology and "ecospirituality", he is famous for proposing that a deep understanding of the history and functioning of the evolving universe is a necessary inspiration and guide for our own effective functioning as individuals and as a species. Seed questions for reflection: How has your story of the Universe shaped who you are? Can you share a personal story of a time you experienced the story of the Universe? What does the New Story of the Universe mean to you? I think this is really beautiful. I am certain my story of the Universe is what has shaped me to being the teacher I am today. Without the challenges I had in my childhood, I would not be so full of love to help children through theirs. I experienced the old story of the Universe when I went on my first retreat. I was soooo new on my journey and very timid. We were doing a guided meditation to summon our inner goddess. Because I was so broken as a woman, I didn't feel I had one. So my meditation just took me to an empty cave. Suddenly an angelic figure appeared and I felt a sense of calm. When we were sharing our stories, I sat and listened to all the others. One woman who was our nature guide for the weekend and also an artist said she didn't journal anything but just drew a picture. When she turned it around, it was the exact figure I had seen in my meditation. It was then that I felt I was beginning to understand the connection of us all. She gifted me with that drawing and to this day it hangs in my closet right over my dresser so it is the first thing I see. As for the New Story, I am still listening. The world seems so chaotic, I am unsure how this story will unfold. But I do know we all need to work to tell it together in a mindful, kind way. Science tells the New Story. It is a story of creative nested emergence. Emergence is not magic. Emergence is what little minds like ours observe when complex networks of interactions that are beyond our ability to map. It is a matter of sheer quantity. We can only picture simple stories. If it takes more than a few dozen interactions in order for a pattern or meaning to emerge we can't see how the interactions lead to the pattern. In the universe, the interactions that form its story number in the thousands and millions and billions and numbers we can't easily name. So our greatest minds struggle to make stories out of them but the stories are mere ghosts of the true story. Before this onslaught of complexity most humans retreat back to the old story. The old story is one in which humanity was the star. This was so because humanity made up the story. These old stories always end with "and finally humanity." In our vanity we believed that humanity was the end product of whatever creation story we were telling. Copernicus should have changed all that. From Copernicus on, science has hammered home the same point. The story of the universe is not about you. You are not the centre of the story. Copernicus said, "The universe is not centered around our home." Newton said, the heavens are not a special place set aside for us to rise to after we die, gravity works there just like here. Darwin said, "The origin of the human species was not special." Hubble said, "the universe is huge beyond even Copernicus' imaginings and it began as an explosion of terrible heat and energy not as a loving attempt to create a nice quiet place to put humanity." NEAR warns us that this nice cozy place could be turned into hell in an instant by a random rock. Yet with every revelation of science, even scientists have clung to a version of the story that places humanity in a special spot. In Quantum mechanics they seek to make us the creators of the universe by describing the "observer" as the one who creates reality. They tell Darwin's story as if it ends with us. They still say "... and finally humanity appeared ... " as if evolution, despite its random nature, was striving to create us and, now that it has, can enjoy its Sabbath. So stop listening to your vanity. The story, the New Story, the Great Story, is not about you. It isn't about the rise of consciousness. It does not presage the evolution of a higher consciousness in which we will all be united. It is the story of Life of which we are but a small part. The Oak Tree, the Giant Cactus, the Mangrove, these are the current stars of the thin thread of the Great Story which is struggling to take place here on Gaia's little world. The greatest product of evolution is the ability to photosynthesize and to build great three dimensional structures for the rest of Life to interact in. It is not our ability to think and to build great sterile three dimensional structures from which we exclude almost all other Life which is a great product of evolution. Does this mean that the best humanity can do is to try to preserve as much of Gaia as we can until we go extinct and Gaia can begin to recover from our evil presence. This is another version of the New Story that is told. These days, there is an epidemic of this depressing post-apocalyptic story appearing in science fiction and zombie fiction. It is a story that comes from humanity's guilt about the wrong path we seem to have taken and our fear of our own capability to commit horrifying atrocities. It is as false a story as the story that we built on vanity. So mindfully let go of your fear and your guilt. The story that will carry you forward to a future of participation in the creatively nested emergence of this beautiful universe is one that talks about human creativity. We are a creative species. In a few short millennia we have invented so many new things. Some of these things have been used to create beauty; others, unfortunately, have been used to destroy it. I propose that if we learn to work in tune with Gaia's desires then we can invent things that create beauty rather than destroy it. What are Gaia's desires? If we look back through evolutionary history we can see her desires and they may surprise you. Soon after Gaia began she was restricted to the sea as a collection of singular cells. For 4 billion years she struggled to find herself and then suddenly 600 million years ago she discovered multiceluarity. Suddenly her diversity was going through a period of exponential growth. Since then she has continued to increase her diversity. Some of her creatures learned to build reefs and these complex surfaces folded back and forth through a three dimensional matrix of water created so many new opportunities for interactions that her diversity increased further. From this part of her story, you can see that she desires diversity. Time and time again, she has been beset by disasters and been set back in her journey of increasing diversity. Asteroid and comets have impacted her home, Terra. Terra has erupted super volcanoes. Sol has let her freeze in periods of reduced fusion. Yet from every disaster she has emerged in a radiation of increasing diversity. If we are a disaster as the second false story, the apocalyptic one, tries to convince us, then Gaia will be spurred to even greater diversity by the extinction that we are perpetrating. From this second part of the story, we can learn that Gaia is an optimist and is always ready to get back up and dust herself off when she falls. IN fact, falling down only increases her determination. She doesn't give up and, as participants in her story, we must learn to do the same. If we have travelled the wrong path for some time, then we must bushwhack our way back to the right path, not lie down and give up or turn back in defeat. Only a couple of short periods after the Cambrian explosion, Gaia began her conquest of land. Gaia is an expansionist. By the Silurian or Devonian, while our ancestors were still experimenting with various fish shapes, her plants were building the first forests in wet lands. By the Carboniferous, before our amphibious ancestors strode onto land, her forests were growing tall and spreading out from warm wet lands into slightly drier and colder places. By the Triassic, while our reptilian ancestors were hiding from the first dinosaurs, her conifers were charging up the sides of mountains and spreading toward the poles. By the Cretaceous, her flowering trees were co-evolving with diverse species of insect, bird and mammal to create complex ecosystems and even greater diversity. By the Paleogene her grasses were spreading across scrublands to create rich new ecosystems covered in herding animals. And by the Neogene, cactuses were spreading photosynthetic structure building into hot deserts. For this third part of the story, we can learn that Gaia is expansionist. She wants to spread Life to new environments. She wants to build three dimensional structures in which Life can multiply and diversify where before there was only barren land. She still has some places to go on Earth. She can build forests on glaciers and mountain tops and in the hottest deserts. She can build ever taller forests. To do this she may need our help. There may be adaptations that will never evolve naturally. It may only be human intervention that can make the difference. But this last bit is a false story. Copernicus taught us that humanity is not special and separate from nature. We are not the end product or half of a dualism. Wilderness and Civilization are not two separate things into which all can be classed. We are part of Gaia. We are like cells in her body. And so if we "help" Gaia, it will merely be our ecological contribution to her. If we develop genetic engineering in order to create new trees which can grow on mountain tops, on glaciers or floating on the oceans then we will not be intervening in nature; we will be contributing to Gaia's diversity in the same way the flowering trees of the Cretaceous did. We will be using our unique attribute, our intelligence, to contribute to the body of all Life of which we are a part. Likewise, if we develop trees which can grow on barren, frozen, vacuum exposed worlds like Ceres or Vesta, then we will have contributed to Gaia's expansionist desires in the unique and wondrous way that only we can. Then if we go extinct, it will not be a sad atrocious apocalypse; it will simply be a species that has had its run, passing into the past while enabling a glorious future. My (old) story of the universe was never mine, it shaped my fears and my dreams, and possibly my path to a certain degree. I was told that story and it has taken many years to realize, that I do not have yet a story of mine. As I reinvent myself, unlinking from all those beliefs, a new paradigm has emerged, sometimes full of clarity, sometimes mostly awe, and always full of mystery and reverence. I can not say I know the new story, the one experienced by me; I don't sense I've been able to fully apprehend it. But that does not prevent me from having the certainty that I am in the process of knowing myself, and, by extension, everything else I need to know. Much of the old story was fear of separation from others and this broken union with others. This union with others offers inner security, yet living through others can also be bad as it is a life of illusion. I feel we are now beginning to find realistic faith in ourselves. I believe people are beginning to find their own authority from within and a faith within themselves. This realistic faith I believe is also breaking down this dualistic mind between ourselves and the rest of the world. This essential split between the known and the unknown, the dangerous and the safe, the devil and the angel, heaven and hell no longer works. The New Story is this unshakable confidence, even when things go wrong, the real and the true cannot be lost. This New Story of the Universe appears to be moving toward unity consciousness. We can never realize our new story until our old story completely passes away. Our universe models perfectly. To me, as humans we are all inter-dependent. Life always existed in some form . This universe always existed and will continue to do so. Just like the way we say God always exists. Our bodies are temporary but our consciousness is permanent. The total energy will always remain constant in this Universe. Just like energy cannot be created or destroyed but always stays, so does the Universe. (And so does God). The Universe story is written spaciously in every cell and genes of my body. It is a story of hope and resilience. Whatever may happen we have within our genes the capacity to understand and rise above to look for a solution as a need of the hour. Imagine, each of us are made of the trials and tribulations of 14 billion years! While I believe the story of the universe is indeed important in shaping us & giving us a sense of place, I also believe that there is a wonderful, and connecting New Story being told; one where many of us understand the deep interconnections of us all. Just this morning I had a heart conversation about the power of story to connect us on the path when we are vulnerable enough to let our hearts truly show to each other. Though we may sometimes feel as if we are alone on the journey, we never are, there is always someone there along the path if we reach out to each other and if we listen to each other's Stories. 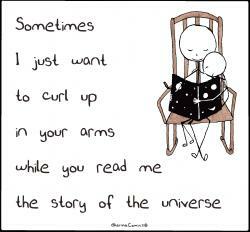 As for a personal story of experiencing the story of the unvierse; for me it is in seemingly small moments like sharing hugs with strangers and then conversation flows one from another because hearts have opened because in the universe everything is connected. It is also in moments where I can feel the heart of a tree; I think of one in particular from my childhood that was a refuge for me out of chaos, when I sat in its shade or branches I felt protected and loved and at peace. I still visit that tree & have hugged it and felt heart from it. The story we have of the universe is very important -- it's the ground out of which we see the world. Sometimes we're indoctrinated with a story that we eventually set aside for a story that we learn on our own. The story of the universe that I've come to learn and believe is that everything in form emerges from Infinite Eternal Formless. Based on that, I am aware that I am part of the universe, I am here in form for only a little while and it is important for me to contribute what I am and have during this time. I am a part of the universe, not apart from it, so I feel a kinship with all that is which results in some sense of belonging and compassion. This story of the universe is fairly new for me, as of the last dozen years or so, and it is developing and taking deeper root in me. It feels right. It feels meaningful and alive. The old story was that a God separate from the universe and out there some where created the universe and all that is. The new story is that the Infinite Eternal Formless usually called God took on form, incarnated, and manifests in all that is, which means that all that is is sacred and is God -- it's for us to realize that and live accordingly, relating to one another and our world as sacred. Namaste. To me, the New Story clearly is a story of much greater interconnection - where we, as the organs of the Gaia are sensing the imbalances that are happening. God Created the world out of about 17 billion years of chaotic darlkness.The darkness and emptiness in our short lives are nothing for the Power and Love of God, Who Can Make us dazzling diamonds in a nano second if we trust in Him.